There’s a remarkably easy and inexpensive way to create eye-catching graphics for your blog, and I’m going to show you how to do it. All you need to get started is Microsoft PowerPoint. …And you know what? It works beautifully. I designed a graphic to promote my newsletter, and attracted more subscribers instantly. I also whipped up a graphic to promote my Hire Me page, and more people checked that out, too. The question is, are you ready to produce some graphics that gets results for your blog? If so, watch this step-by-step video I created for DIYthemes, and you’ll be set! I chose PowerPoint because you can copy and paste photos, add shadows, create transparent shapes, and then group it all together and save it as a picture. It’s easy, and you don’t need advanced image editing skills. As you saw in the video, anyone can do it. Do you know the best part? When I added these PowerPoint graphics to the left sidebar of my blog, I increased my subscribers and attracted more leads. Who knew that a simple graphic created in Powerpoint could have such an impact? If you want to inspect the graphics I created for my blog, see them below. I would love to hear what you think. So there you have it! PowerPoint is the new image creation tool for bloggers! Are you going to create some PowerPoint graphics for your blog? If you do, share them in the comments. 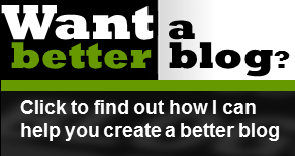 About the author: Kiesha blogs at WeBlogBetter.com, a blog devoted to offering blogging tips. She’s a writer, editor, and blog consultant for small business owners. 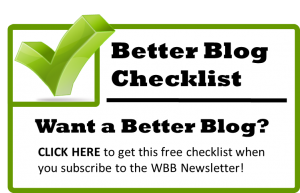 Connect with her on Twitter @weblogbetter.